EasyMiner/R - the current open version of the EasyMiner system. EasyMiner/R uses the R arules package, implementing the apriori algorithm. There is the option to execute pruning and classifier building, based on the Classification Based on Associations (CBA) algorithm. For this, we use the rCBA package. Finally, EasyMiner also offers outlier detection based on our fpmoutliers package (only via our REST API). E: Marking interesting rules in the Results pane saves them to the rule clipboard, which persists across rule learning tasks. 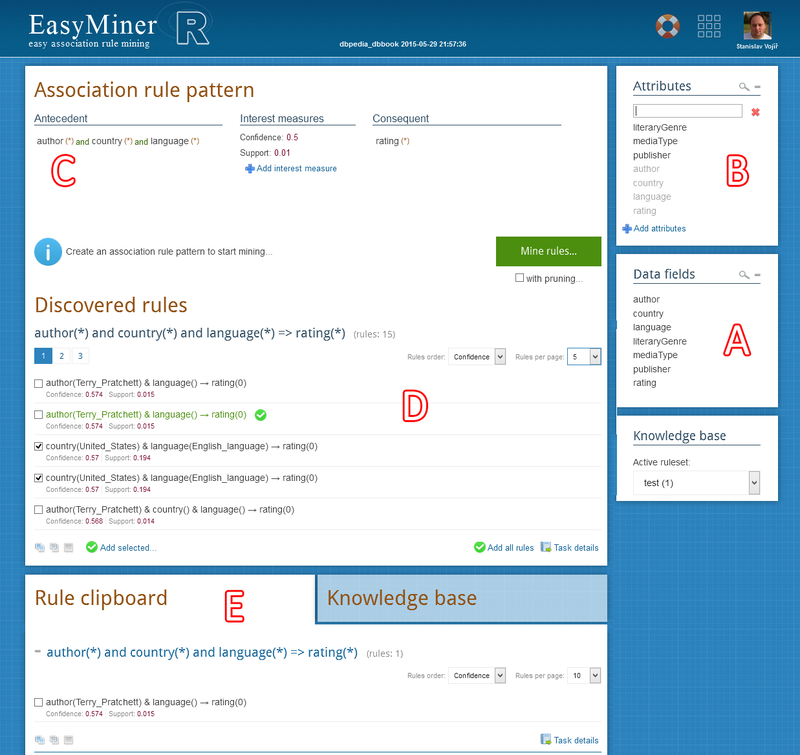 EasyMiner with Spark backend offers "big data" processing capabilities for association rule mining and rule-based classification. This version of EasyMiner is not freely available and license is per request. Rauch, Jan, and Milan Šimůnek. "Apriori and GUHA–Comparing two approaches to data mining with association rules." Intelligent Data Analysis 21.4 (2017): 981-1013. For more information visit our page on EasyMiner with LISp-Miner backend.